There is peace, love and harmony when trust is proven. These concepts are still true today in any organization. 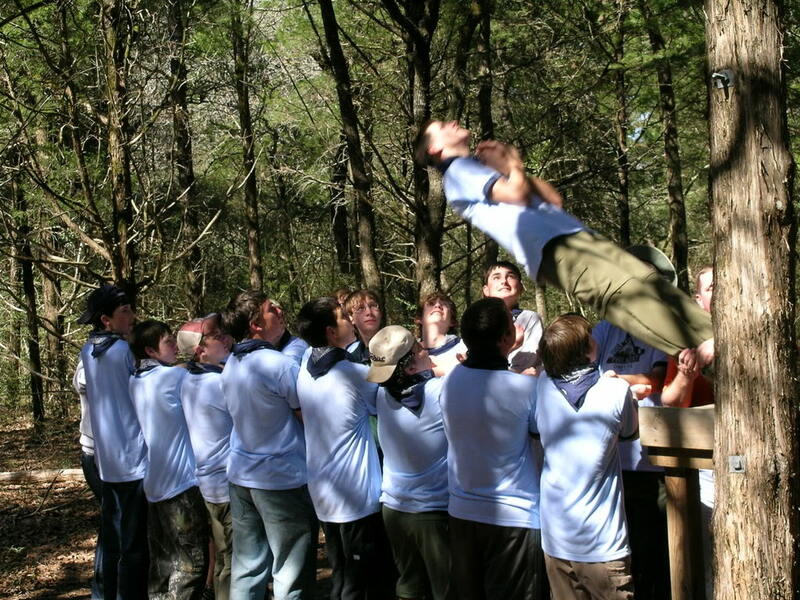 After all the youth had fell from the platform and experienced that brief moment of "I have no control, I hope they catch me", some of the over eager high school boys said, "Ok, James, now its your turn!". I thought what are they talking about? I had already let all the youth go and I assisted in catching each one. They persisted, "You climb up there and fall, we will catch you!" Now I am not a physics major but I knew I had over 150 pounds on these guys and even more on the girls. (Weight x mass x velocity) You get the picture. I could either explain my way out of this or take the opportunity to show that I not only believed in what I was preaching but that I trusted and believed in them. I am sure God was chuckling at this point. He definitely has a sense of humor. I climbed up on the 4 foot pedestal with my back turned to the group. I could hear the guys bracing for the impact and some of the girls thinking "This is crazy" but trusting the guys regardless. I said my prayers, took a breath and fell backwards. I experienced a moment for what seemed to be an eternity. It felt like I was in a state of suspended animation like the Matrix. I could not save myself. I thought, "What ever happens, happens and I must trust God and this group of daring youth to catch me." Falling into their arms was such an expression of God's love for me and their love for me. I learned they were not going to let me get hurt. That was a milestone in my ministry. Many of those youth have grown and have their own families now. I wonder if they ever remember that day where they did something that did not make sense? Regardless, I will never forget them and the way God spoke to me through them. Psalm 138:8 The LORD will work out his plans for my life— for your faithful love, O LORD, endures forever. Don’t abandon me, for you made me. Still to this day I find myself "Trust Falling" into God's will for my life Do you? Do you find yourself trusting God when it does not make sense? Is He calling you out of your comfort zone? We can make plans but they rarely involve trust, sacrifice and faith. We usually cater to our strengths but by doing this we only realize how weak we really are. If you want to learn more about God's love, trust Him when it does not make sense. Remember He will NOT let you go. He will not abandon you and that His plans for your life are fueled by His compassion and love. 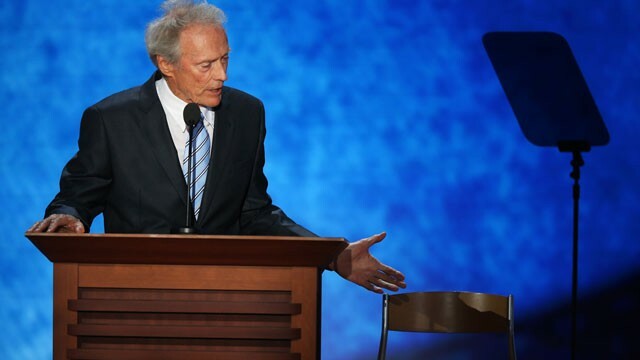 During the 2012 Republican National Convention, Clint Eastwood (Actor) directed his conversation to an empty chair which was to symbolize current President Barack Obama. 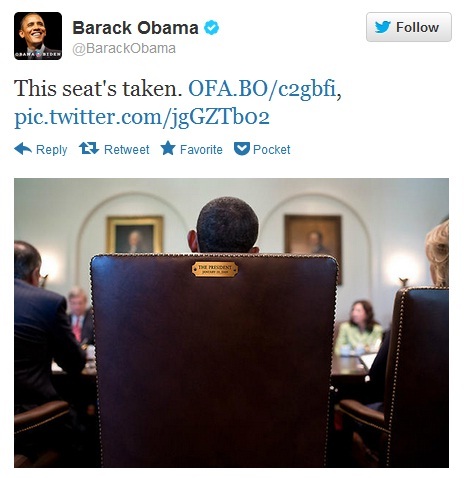 Barak Obama replied via his twitter account with this picture saying "This seat's taken"
I share this not to go on a political rant on either party but to talk for a moment about the "seat" of the President. Quite arguably the seat behind the desk of the oval office is the most powerful seat in the world. Whether we agree with the person behind the desk or not, they are in charge. I was reminded this morning of an even more important seat. That seat is the throne of our lives. Who or what do we let sit in the center of our lives and make the call on what we believe, how we should react or where we should place our devotion? God tells us plainly in Exodus 20:3 that He is to be in our seat. The center of our lives. It is saved, made and reserved By Him for Him alone. "You must not have an other god but me"
When we value things or the approval of others OVER God's will then they become our idol. When the opinions of friends cause us to ignore and out right violate God's word we give them god-status in our lives. We give them "The Seat". If we are not careful we can elevate good people, loved ones, supervisors, church work, etc. over God's will for our lives. God is a jealous God! He wants, demands and deserves to be number one. When God is first, everything else falls into place. When a car is being built there is only ONE driver's seat. When God created us, He designed the seat of our heart for Himself. Remember that seat is taken! Who or what is sitting in "the seat" of your life?